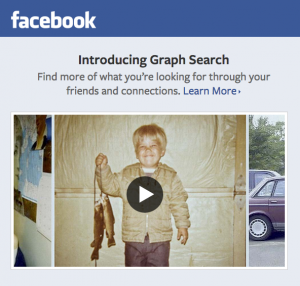 Facebook has already cornered the market of social media and made a huge impact on the way people use the Internet, but yesterday the company unveiled a new feature called “Graph Search,” which will now change the way we think about Internet queries. This new feature allows you to search across your friends’ timelines for music, books, restaurants, photos; you name it! Research experts at Facebook know that when a person looks for a review on a product or service, the ones they usually trust most come from family and friends. So what better forum to search than Facebook, where your closest allies have ‘liked,’ ‘tagged,’ and ‘posted’ about everything from A to Z.
Facebook employees have extensively tested the new feature for the last month, which is tailored to the individual user with its design to query the database of their personal connections. However, the user does not only have to search by ‘friends.’ For example, if you’d like to search for the best restaurants in D.C., then you can look for those that have been ‘liked’ by people who are native to the D.C. area. The ability to search in this manner has been long awaited by the approximately 1 billion account holders who, up until now, have basically only been able to browse. Facebook’s Chief Executive, Mark Zuckerberg, emphasized that one of the most important qualities of “Graph Search” is that it will still maintain a user’s current privacy settings. You can currently sign up for the beta version from a link on the Facebook Newsroom page, and can also watch the official intro video. Previous Previous post: Smart Homes, 3D TVs, Self-Driving Cars… What’s Next?